I’ve been wanting to create a homemade Werewolf Halloween costume for awhile, and after 6 years in the Army, I finally completed my term of service and had some down time to make it happen. I’m the same guy that made the “Gargoyle” and “Reptile-man” costumes, previously featured on this site. I learned a lot from those costumes and my main goal with this year’s costume was to create something that would be a lot simpler and easier to put on. The homemade Werewolf Halloween costume was time consuming to make, but the process was fairly simple and could be easily replicated with a lot less time if some of the details were downgraded. I started by buying a spandex shirt and pants, and then shaping muscles out of memory foam. I used anatomical muscle diagrams of both humans and wolves to try to get it pretty accurate. Eventually, I ended up with 178 hand carved muscles, which I then glued onto the spandex shirt and pants. If someone wanted to do this without spending as much time, they could just reduce the quantity of muscles and stick with more generalized shapes. You could also use regular foam instead of memory foam. Next, I had a great friend and seamstress sew a second spandex suit, which I then slipped over the first one. If you aren’t able to get a custom sewn suit, plenty of ready to wear ones are available online or in theater/dance stores for around $50 – $75 each. To attach it and keep the seams minimal, I had the upper portion of the suit attach under the groin area (like a child’s onesie) with a snap for bathroom breaks. Next, I used fabric glue to create veins running throughout the body and stippled across to create a skin texture. Then I painted everything with fabric paint. Once that was complete, I began the arduous process of hand gluing two pounds of alpaca fur and horse hair across the body. If you don’t have access to an alpaca farm, generic synthetic fur would work fine too. Once all that was done, I created the hands from an old pair of monster gloves I had, which I cut apart, resized, and made into the long fingers you see in the photos. I also recycled an old pair of monster feet into the wolf legs in the photos. To create the stilts, I used 2-by-4’s which I cut and shaped into crude retrograde style legs with shoes attached about 9 inches from the ground with my toes angled down (like very very high heels!). To support my weight and make walking easier, I attached bungee cords to the base of the stilts and then created supports that attached below my knee. The end product was pretty comfortable; I could trot, walk, and even go up and down stairs with little difficulty. The plans to create these digigrade stilts are available online and on youtube, though I changed them quite a bit to improve the design and make them more durable and comfortable. They look a bit intimidating to make, but they really weren’t too bad and pretty inexpensive — maybe $75 for all the materials with extra left over for replacement parts. You can also make them with simple tools like a drill and handsaw. Finally, to disguise everything, I pulled a pair of spandex leggings over the stilts each time I put them on and attached those with Velcro. To create the mask, I purchased a prosthetic wolf face, which I then adhered to a spandex facial hood which I had previously elongated with more memory foam. I glued ears to the mask that I had from an old gargoyle mask, but repainted them and faded out the transitions with liquid latex. Once all that was finished, I began applying giant wads of horse and alpaca fur and then carefully painting everything. When everything was completed, I simply slipped everything on, stuck in some sclera contacts that turned my eyes bloodshot with white pupils, painted a little makeup around the eyes, and then pulled the mask over my head. Total time to put on costume was about 45 minutes — a vast improvement over my previous costumes which took hours and hours. My total height was about seven-and-a-half feet tall once I was strutting around town. Thanks again to Elad and Tamar for hosting another great contest with amazing prizes! I’ve seen the amount of costumes increase each year on his site and know he must spend an arduous amount of time and effort to continue bringing these great contests year after year! PS: My wife went as Little Red Riding Hood, so I included a picture of the two of us together. Her costume is NOT in the costume contest, but I thought it would be nice to include some pictures of both of us! I have seen both of your other amazing costumes (love the reptileman video) and now this. You inspire me! What an amazing artist you are. Your attention to detail and execution of the costume is fantastic. Your description is very informative and as a person that has been making my kids costumes for many years, I understand the painstaking hours involved. Truly brilliant! Amazing costume, very realistic. So much work but worth it. The photo of you with your wife as Red Riding Hood is so cute. You make a very charming couple. 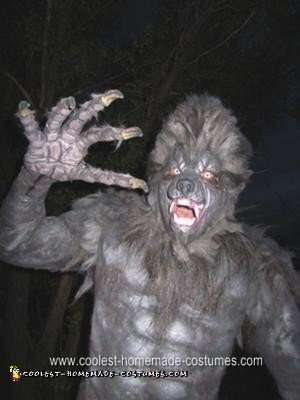 I can see how you would scare just about anyone as Wolfman. Liked your other costumes too. You have a lot of talent. Maybe you should be a special fx man! Well done, well done mate! You need to come down to New Zealand and see our kiwi director Peter Jackson :) (Lord of the Ring, he’s doing the Hobbit thing at the mo). Great team work to you and Red Riding Hood. Isn’t it so cool to do something you really enjoy doing! Appreciate your patience and creativity – Thank you. Wow! worth waiting to see what your costume would turn out like! Dude, seriously you have found your calling…the other two were absolutely phenomenal and now this? outstanding! loved the video! I’m sure you’ve cleaned up with prizes and trophies at every Halloween party you’ve been to! I’m a professional Halloween costume designer for the biggest mass market companies in the world. I found this site and your video while researching some costumes. That video was incredible, you are super-talented – the costume is awesome and that’s unbelievable dedication to work on this for 300 hrs. You should get into this professionally if you haven’t already! Just beautiful! I am interested in shooting a documentary with my production company about you and some 2 other people who travel to Vegas and compete for Halloween. I was E.T. and met you at Tryst last year briefly. Hopefully this gets to you! Please email me at filmthomas8@gmail.com and I can give you more details! Thanks! Absolutely love your work, fiddle with a bit of costume making myself but you are unbelievable. Thank you for sharing the technique just in case I ever get the time and courage to give it a go. Great job on the werewolf. 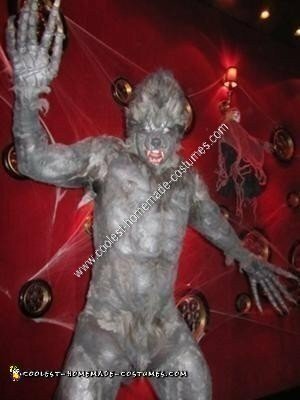 I have been researching well-done amateur werewolves for a couple of years, and yours is the best non-commercial suit I’ve seen. My wife and I had planned to do Red Riding Hood and the Wolf this year, but I let time get away from me. But with your excellent how-to, I might finish it after all. Thanks tons! I love the end of the video when your at the bar having a fruity drink … Hysterical! Lot of work but looked like it was definitely worth the effort. Great! One serious question, I’ll try to put this delicately, how do you use the little Werewolf’s room once you are in the costume? And…thank you for your service. Dude you inspire me. How many days would it take a novice like me to put together? Secondly, thank you for your service in the Army. I’m a retired Marine. Any help would be appreciated. Have two parties to go to… one this Saturday. Help!